The Bloomin’ Feet Swap ’07, coordinated and supervised by the fabulous Amanda, has drawn to a conclusion. I sent a package off to Hillary and a package for me arrived last week. I was thrilled to discover Leah’s name on the return address label. Leah and I have read each other’s blogs for quite some time now and have become friends for the same reason many of us are friends – we love knitting. However, something happened in Leah’s life recently that served to truly bond us. This shared experience has certainly deepened our friendship, but you know what? Nothing says friendship like a pair of handknit socks. Aren’t they wonderful? The colors – which Leah worried weren’t springy enough for a “bloomin” sock swap – are just so me. The pattern is lacy but not over done. The yarn is incredibly soft and they fit perfectly. There were other goodies in the package like Green ‘n Black’s chocolate (my favorite) and some pretty flower candles and note paper and a Burt’s Bees sampler pack. Fabulous stuff, all of it. When I emailed Leah to thank her she replied, “The socks in no way show you how much I appreciate your friendship. Just think of them giving you a hug from me each time you wear them.” It’s an absolutely perfect sentiment. Thank you, Leah. I’m looking forward to a lot of hugs from you. 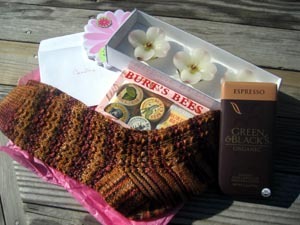 That’s the best sort of swap package … what a great job she did on the socks! They are soooo you!! Leah did a great job despite her grief. She’s a wonderful friend! Those socks are just absolutely… words fail me. Again. (You wouldn’t think that would happen so often to a person who writes for a living.) 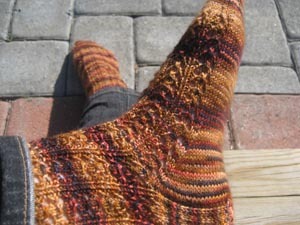 I love that colorway: without the purple stripe, meh, too orange, but with it, bellissimo, mwah mwah mwah! I can’t blame pregnancy hormones but your post created a tear or two – what a nice friend. They’re beautiful and you received a really wonderful package! I love the socks! Lucky you! How wonderful! The sock and the sentiment behind them as well. Lucky you for the friendship that transcends time and distance! Beautiful sentiment and beautiful socks. How lucky you are for both. What a wonderful package! Sounds like a wonderful friendship, too. I love the colors and she did a great job with the knit. Lucky you! Those socks are really lovely. Great colors and a great pattern to celebrate a great friendship. oh, i love that color and the pattern shows them so nicely. absolutely gorgeous! Leah is a gem -and her sweetness shines through every single stitch in those beauties. What a wonderful package and sentiment. What a wonderful friend! The socks and gifts are lovely but the friendship is priceless. Gorgeous socks! How wonderful to have them knit by a friend. They are beautiful socks! I love the colors and pattern. They are lovely. Enjoy them! Great socks and what a lovely package! Leah did a wonderful job. Luck you! I guess the specs would have been good, huh? The yarn is Claudia’s Handpainted in Blue Terra Cotta. The pattern is ‘one of the lacy ones’ from Sensational Knitted Socks. Finally, they could not have gone to a better person! Thank you for the kudos and the friendship! The socks are beautiful and your package is so nice! Leah is a special person. Oh, what lovely socks and even better from such a good friend. Those are some great socks! I had to see if your Leah was the same as one I know, nope, but I did have to leave her a comment of support. Glad she’s got you for a friend. Awww! What a great friend! Lucky you! These are great socks. I am glad that Bloomin Feet was a success. Your pal did a wonderful job on the socks. Just gorgeous! 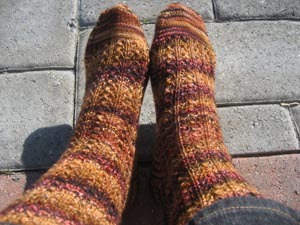 I went to Leah’s blog to discover what yarn she used on your socks and then I read that she had knit 3 socks! How cute that in the comments you had said that her Bloomin Feet pal would be happy with any of them. I guess that was definitely true after all! Looks like that swap was a HUGE success. No wonder Amanda only takes a select few people for it. The socks are gorgeous, what a wonderful gift! Can you share the name of the pattern with us? So cool Carole. The socks are beautiful too. What lovely socks! Isn’t it just so cool how we can connect with one another in so many ways other than knitting? I know you will feel her frienship like a good footrub every time you wear Leah’s beautiful socks! What lovely socks! Isn’t it just so cool how we can connect with one another in so many wayother than knitting? I know you will feel and appriciate her frienship much like a good footrub, every time you wear Leah’s beautiful socks!